This is a complete lesson for third grade with teaching and exercises about the basic concept of multiplication, and about the connection between multiplication and addition. Multiplication is defined as meaning that you have a certain number of groups of the same size. Then, it can be solved by repeated addition. Students fill in the missing parts in multiplication and addition sentences to match the given visual models (pictures). They also draw pictures to match given multiplications. that you have a certain number of groups of the same size. Here we have five groups, and each group has two elephants. Here there are three groups, and each group has four dogs. 1. Draw dots in groups to match the multiplications. 2. Fill in the missing parts. ____ groups, ____ scissors in each. ____ groups, ____ rams in each. ____ groups, ____ dogs in each. ____ group, ____ carrots in it. 3. Write an addition and a multiplication sentence for each picture. ____ × ____ = ______ b. ____ × ____ = ______ d.
4. Now it is your turn to draw. Draw balls or sticks. Write the multiplication sentence. a. Draw 3 groups of seven sticks. b. Draw 2 groups of eight balls. c. Draw 4 groups of four balls. d. Draw 5 groups of two balls. 5. Draw groups to solve the multiplications. 6. These problems have to do with groups. Write a multiplication. Drawing can help. a. How many legs do five cows have? b. How many wheels do six bicycles have? d. One bunch of grapes has 11 grapes. 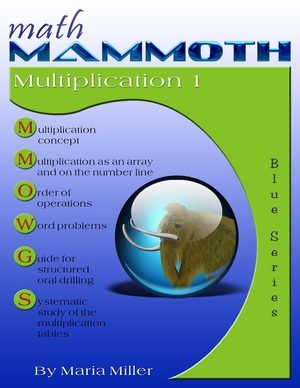 This lesson is taken from Maria Miller's book Math Mammoth Multiplication 1, and posted at www.HomeschoolMath.net with permission from the author. Copyright © Maria Miller. Download ($5.20). Also available as a printed copy.